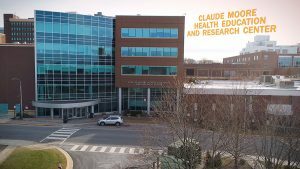 The Claude Moore Medical Education Building is the five story home to the Medical School and the state-of-the art facilities created for The School’s Next Generation. 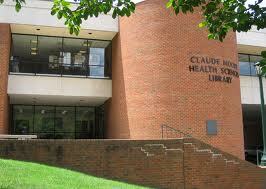 It contains the innovative Learning Studio and the Clinical Performance Education Center (CPEC). CPEC’s two floors contain the Medical Simulation Center and Clinical Skills Center. The Mulholland Student Lounge, an auditorium, Student Affairs Office and the Office of Admissions are also housed in the building. 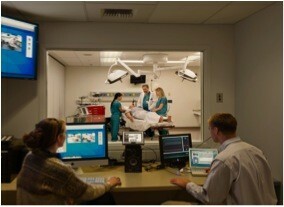 The Medical Simulation Center (SIM Center) is one floor of the Clinical Performance Education Center. On the ground floor, it has four fully realized clinical spaces: an intensive care unit (ICU), an operating room (OR), a labor and delivery suite (L&D), and an emergency room (ER). All spaces are fully equipped so that students are in a fully replicated space in which they can work with patient simulators, which breathe, speak, and respond to procedures and medications. Behind a one-way mirror, operators can also manipulate simulators providing students with real time experiences. In addition, there are seven task training rooms for proceedures such as endoscopy, endotrachial intubation, and ultrasound surgical central line placement. The library has an extensive collection of online resources, journals and books that are available in the library and remotely. The Medical Education Librarian works with students and faculty throughout the four years to enhance information seeking skills and critical thinking and library staff meet with representatives of the Mulholland Society on a regular basis to ensure that the library is responsive to student needs. 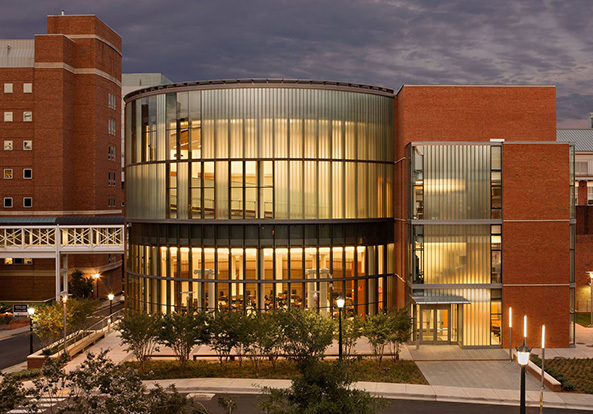 As part of our educational vision, Inova has established its own Claude Moore Education and Research Center, which features 12,000 square feet of modern space dedicated to the educational needs of our UVA students. 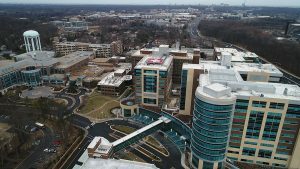 The Inova Campus boasts an additional 12,000 square foot medical simulation center named ICAMS and a several thousand square foot surgical simulation and advanced practice training space called ASTEC. These spaces enable students to learn through hands-on experience and side by side with our faculty, residents, and nurses. Both centers and Inova always focusing on inter-professional collaborative training and educational experiences. In addition, these dedicated centers are outfitted with state of the art tele video communication facilities to establish seamless and virtual meeting opportunities for whatever the need or purpose between the two campuses. Educational or administrative you will be in the room with your UVA faculty and colleagues without having to drive anywhere. The Claude Moore educational space for our medical students specifically houses flex seating classrooms with tele video capabilities, as well as, a large individual study carrels area complete with desktop computers. Your very own study lab has been flexibly suited to allow for group learning sessions, as has, the newly refurbished testing lab. Students have their own relaxation space with kitchenette, computers, eating and relaxation space and if you want to grab a quick ride just hop on the lounge’s Peleton Bike. This is your space to unwind. 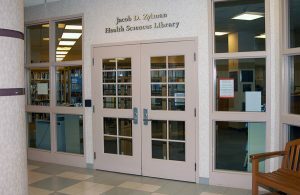 The Jacob D. Zylman Health Sciences Library is an on-site medical library at the Inova Campus. There are three study/conference rooms and 16 individual study carrels as well as tables for group work in the library. Students have full 24/7 access and are supported by an outstanding team of librarians as well.